Again see if having a tracker fitter will benefit your premium, and if so by how much. It's also a great idea to ask every insurer you talk to the direct question of what you can do to save money on your insurance. Whether you are looking for cheaper recovery vehicle insurance for a tow truck, large breakdown vehicle or car transporter, our panel of specialist insurers are ready to search out great deals for you. 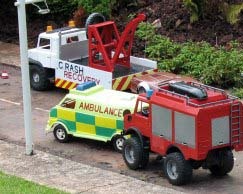 If you own or manage one or more recovery vehicles then you are in the right place when requesting breakdown vehicle insurance. Given the widely varying costs between recovery van and lorry insurers it's always worth shopping around - whether you have just one vehicle or manage a fleet of trucks (visit our Motor Fleet Insurance page for fleet recovery vehicle insurance). The panel of specialist insurer partners can help with new businesses or established recovery operators but, if you have been running your business a while, do ensure that, if you have a good claims experience, that this is taken into consideration by your insurer. Do also ensure that your policy offers compensation for loss of use of recovery vehicles and adequate cover for your liability for commercial loads of customers vehicles. Different brokers and insurers will have their own factors that they take into consideration when accessing the premium payable for a particular policy so gather as much inside knowledge as possible! This service is operated on our behalf by Seopa Limited.